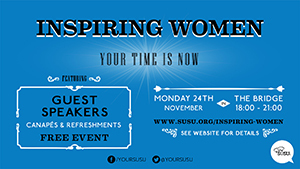 Inspiring Women, an event encouraging female SUSU members to partake in elections and reach for leadership positions, returns to The Bridge on Monday 24th November. Last year, guest speakers Jaki Booth (Chief Executive of SUSU), Tessa Harrison (registrar at University of Southampton) and staff from the NHS, the County Council, and the founder of Beyond the Streets all came to give talks about succeeding as a woman. The event, open to students of all genders, is one of the most widely known about Your Skills sessions of the year.